For many years, Dr. Guy Harvey has been a supporter of Nova Southeastern University, with his focus in the Halmos College of Natural Sciences and Oceanography. 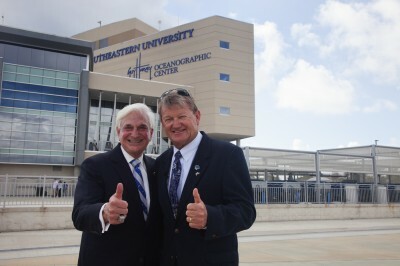 His philanthropic support led to the creation of NSU’s Guy Harvey Research Institute as well as the naming of the Guy Harvey Oceanographic Center building on NSU’s Ocean Campus. Recently Dr. Harvey sat down with Tom Hudson from WLRN to talk about a wide range of topics – from art to marine conservation to research being conducted at NSU’s GHRI.